Members of The Tech enjoy terrific benefits, including unlimited museum admission; discounts at the IMAX theater, The Tech Cafe and The Tech Store; invitations to exclusive Member Parties; and much more. Your membership also provides much-­needed support for The Tech’s mission to inspire the innovator in everyone. Membership dollars help us offer exhibits and programs that make The Tech a vital resource for our schools and community and give more children access to STEM learning. With your support, The Tech provides free field trips and hands-­on science labs for students in low­-income schools. Memberships also help support our signature programs, The Tech Challenge, presented by Dell, and The Tech for Global Good. If you’re not a member, sign up today to join us! Members enjoy FREE members-only events. Check back here for ticketing as space is limited. Member Movie Mondays are back! All members can view one educational IMAX film for FREE every Monday from June 17 to August 26. Member Movie Screening — June 7. Be one of the first to see our latest IMAX adventure "Apollo 11," in the world’s first IMAX Dome Theater with a laser projector. Member Mornings Weekend — August 17 & 18. Members get early access to The Tech and enjoy additional hands-on activities. Member Party — September 20. The party to end all parties. An after-hours bash with food, fun and festivities. Member Mornings Weekend — December 14 & 15. 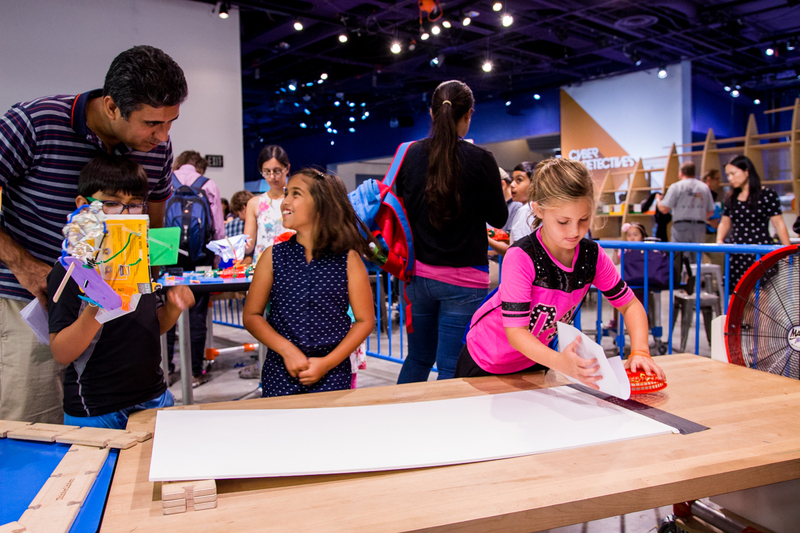 Members get early access to The Tech and enjoy additional hands-on activities. Dates are subject to change. We’ll email you when tickets are available. Please list info@thetech.org as a trusted address in your email client. If you have opted-out of email, you can check back here for updated info and ticketing. Unlimited museum admission for a year. 50% off museum admission and IMAX educational films for your guests. 10% off purchases made at The Tech Store, The Tech Cafe and the IMAX concession stand. $50 per-camper discount at Summer Camps @ The Tech. Call 800-854-3684 to redeem. Free extended care at Summer Camps @ The Tech. Call 800-854-3685 to redeem. Grab some piping-hot popcorn and a soda, then settle in for a giant-screen adventure in the IMAX Dome Theater. Members get first dibs on complimentary screenings for new educational releases. Twice a year, our galleries and rooftop terrace swell with excited members enjoying an evening filled with hands-on activities, fun food and drink, and a festive family atmosphere. Watch this page — and your email inbox — for details. All members of The Tech receive free or reduced admission to more than 300 science and technology centers worldwide through the Association of Science-Technology Centers (ASTC) Passport Program. Local restrictions apply to museums located within 90 miles of your residence and/or your host museum’s location. See the section on this page labeled ASTC Local Reciprocal Program Agreement for exceptions to this rule. View the ASTC Passport Program list of participating institutions and policies. We have an exception to the local 90-mile restriction in the ASTC Passport Program: All members of The Tech receive 50% off admission for each named cardholder at the following Bay Area institutions, which are exceptions to the local restriction. Family Membership level and higher also receive 50% off admission for up to four children. The Tech also offers this reciprocal benefit to members of the above institutions when they visit The Tech. Participants in this local agreement are subject to change at any time. Please call ahead to confirm reciprocal discounts. Always bring your member card(s) and valid ID. Reciprocal admission policies vary by institution. Before your visit, please contact the institution to confirm its reciprocal admission benefits. Reciprocity extends only to regular museum admission. It does not include special exhibit fees, additional attractions, program discounts or store discounts. A gift certificate to The Tech unlocks a day full of creativity, making and fun for someone you care about. They can even be used toward a membership!